It was announced today via Amazon Instant Video/Prime that the premiere of Outlander on Amazon will be preceded by its own premiere event. The event will take place on March 23, 2015. 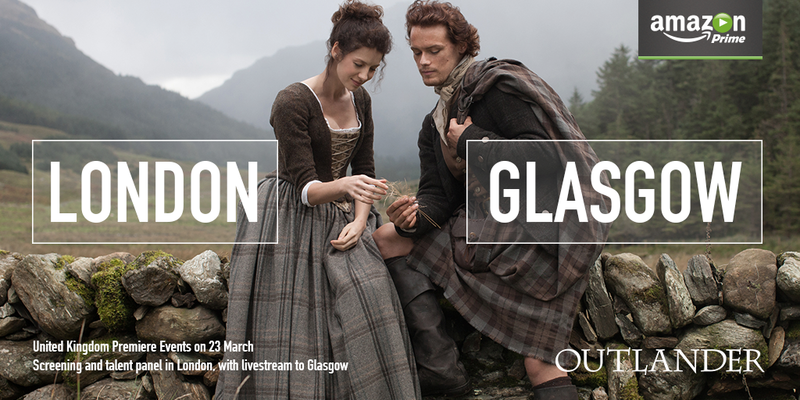 It will take place in London with a talent panel and a livestream of the panel will air in Glasgow. More details on both events will be released tomorrow, so check back for an update on this post then. Update 3/10/2015: The contest for tickets to the events are now open. There is one hitch; you must be on Twitter to enter to win tickets. These are not first-come, first-serve tickets. Based on the rules, there will only 25 winners (with a plus one for each) for London and 35 (with a plus one for each) for Glasgow. The details also say cast plus the executive producer (Maril Davis and/or Ronald D. Moore) will be there. The contest ends on March 16, 2015. Good Luck! This entry was posted in Events and tagged Events, Glasgow Premiere, London Premiere by Sarah Ksiazek. Bookmark the permalink.